Starting from humble beginnings, Adelaide electrician David Stevens was trained by his uncle the old-fashioned way, a way where quality materials and first class workmanship came before profits. David first identified a problem with the solar industry in 2010. He disliked the way industry giants were treating consumers: supplying little pre-install information with no assistance after installation. What annoyed him most were the solar companies run by entrepreneurs who structured their businesses to shut down when the industry went quiet, in turn leaving consumers without warranties. Determined to offer a reliable alternative, David made the decision to establish Goliath Electrical, as it was known then. His vision was to build a company that would provide high quality solar systems to South Australian consumers, installed by friendly local electricians, building strong service relationships for the long term. Since 2012, the philosophy hasn’t changed but the name and team have. Now known as Goliath Solar & Electrical, the small local team of thirteen are dedicated to providing good, honest and reliable customer service, both before and after installation. David is the founder of Goliath Solar & Electrical. His 13 years experience working as an electrician have equipped him with top shelf solar and electrical knowledge which he brings to his current role overseeing the installation team. He is still very hands on, often helping with installations and performing the rare warranty work. Tom's passion is customer service. He brings 13 years of experience in team management with Bank SA and in his role overseeing the sales team and ensuring delivery of premium customer service. With over 6 years solar sales experience, his knowledge is as broad as any qualified solar installer. Joining Goliath after 10 years as a team leader with Coca-Cola, Ben transitioned into solar sales and customer service, receiving great praise from our customers due to his honest nature. 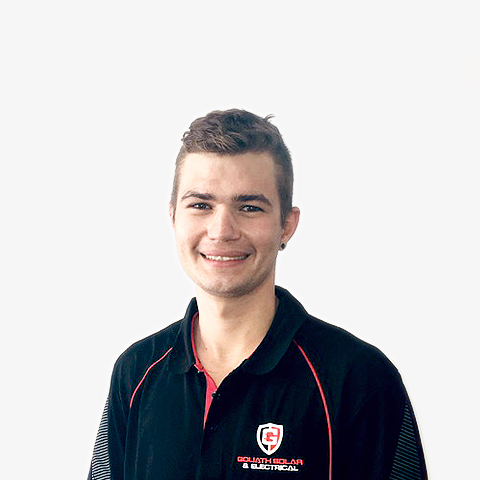 Jack is the Goliath office and workshop manager; he is our local larrikin who is responsible for the smooth operations and stock control that take place behind the scenes. With a wealth of marketing experience working on one of Adelaide’s biggest sporting events, Rhiannon felt it was time to take on another Adelaide giant: Goliath Solar & Electrical. With Thaelen, Josh & Jack. Thaelen is our longest serving tradesman, originally starting with Goliath as an apprentice in 2013. Thaelen and his team have completed over 1000 Solar installations. Sam is another proud product of the goliath solar and electrical apprenticeship program. After years of learning his trade under the owner Davids Guidance, Sam now runs his own team and mainly covers the southern suburbs of our state, This crew is also responsible for those Awesome facebook photos. Chris and Hayden bring 16 years of electrical experience to the installation team, they are experts in customer service and pride themselves on having the highest standard of workmanship.